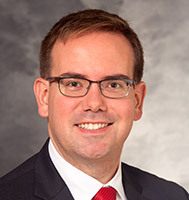 Dr. Stadler is an Assistant Professor of Neurological Surgery at the University of Wisconsin School of Medicine and Public Health. He completed his undergraduate and medical school education at Northwestern University through the Honors Program in Medical Education, followed by neurosurgery residency at Northwestern University. He received advanced training in minimally invasive and complex spine surgery while at Northwestern, prior to completing pediatric neurosurgery fellowship at Stanford University. Dr. Stadler is a board-eligible pediatric neurosurgeon who specializes in the care of children and adults with congenital and complex spinal disorders. He treats a broad range of neurosurgical disorders, and he primarily operates at American Family Children’s Hospital. Dr. Stadler employs the newest technologies and techniques in the care of his patients, with particular interest in offering the least invasive options to provide safe and successful surgeries with faster recovery.